Am I Normal Yet? Is easily one of the most relatable YA novels I've read in a long time- perhaps ever. I genuinely think that if Holly Bourne had been writing books when I was a teen, there's no way I would have spent so long wondering if I was actually a member of an alien species stranded on Earth, or why I was so weird and abnormal. Any reader, teen or teen-once-upon-a-time, will relate to most of this book. Even if readers don't share Evie's specific conditions (General Anxiety Disorder & OCD) I'm sure they can relate to her fear of losing control, of failing at something that you've worked really hard for (not necessarily recovery) and just the general pitfalls of trying to find your feet in life, work out what you're good at and what you enjoy. Life-altering Mental Illnesses aside, I loved how ordinary Evie was. Her worries and anxieties, for the most part, are exactly the same as every teen's: boys, friends, not seeming weird, having fun, trying not to enrage parents unduly. She just has some extra things that she has to learn to deal with. 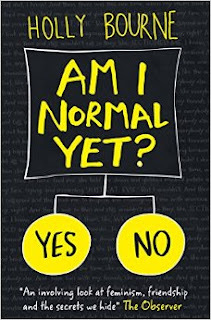 It's very much a character driven plot, as it's quite a personal journey that the reader is following- it's basically just first few terms of Evie's experiences in college after being home schooled following a meltdown in school and a subsequent hospitalisation. She's eager to get back to being normal and determined that her OCD is under control enough to cope with new people and new places. Her BFF has had an identity transplant after hooking up with a dirty Emo kid, and she's gone full Courtney Love overnight. It's for the best though, as it's Evie's new friends who are the absolute stars of the show supporting character wise- 5ft 11 Ginger feminist Amber (who I'm fairly certain might be me IRL) and friend in primary school reunited, daughter of a hippy Lottie. Collectively, the Spinster Club. I loved these three girls together. Supportive, angry, smart and determined to be active in changing things. I loved how determined they were to pass the Bechdel test in their own conversations. I have not laughed so much at a book in some years, nor felt such affection for a protagonist and her crew. Evie's sister Rose needs a mention too- the wise beyond her years tween that gets some of the book's best lines. Such a brilliant character that I really hope we get to see more of in the ongoing series. HB deals with mental illness incredibly sensitively- it seems realistic, no melodrama, no histrionics, just an ordinary person trying to cope with a malfunctioning brain in the best way that she can. Sometimes well. Sometimes badly. Sometimes with fury and sometimes with acceptance. I liked how personal recovery is presented- something that's different for everyone. In AMIY? We witness some of Evie's therapy sessions, some of her behaviours...the reader can tell before Evie does that things aren't going well towards the last act. I really liked how complete a character Evie was- her illness was a part of her rather than being the only thing really explored, which is so common. We get a proper picture of what it's like to live with a mental illness, and the horrible decisions that have to be made, and their consequences. Evie tries to keep her OCD a secret from her new friends, convinced they'd abandon her if they knew. It really emphasises the distance we still have to go to de-stigmatize metal illnesses, and really highlights the ordinary, day to day struggles of those that suffer from MH issues.